The ancient Indo-European word for Beech has bequeathed us the following words in several modern languages; mug, box, buck (to wash or soak in hot lye or buck) and to eat, nourishes, property, luck, rich, God, and to apportion, giving us a sense of the veneration placed upon this tree by our ancestors. Beech nuts were rendered into soap and the Beech nut oil was used for cooking and lighting. The smooth grey bark of the Beeches may once have been used to carve symbols, leading to the words for letter, stick for writing, and book in several languages. Ancient Runic tablets were made of Beech wood (the Runes were an ancient Scandinavian magical alphabet). On the Alban and Esquiline hills of Rome there were once Beech groves sacred to the Goddess Diana. Beech nuts were an important food for swine, totem animals of the Celts. There was a Red Beech in Ireland called Ruadbetheach that was the Bile or sacred tree of the O’Connors. 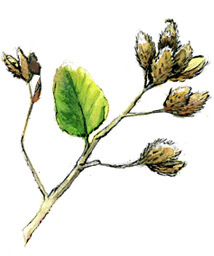 Beech was an important medicinal for Native American herbalists. The Cherokee chewed the nuts to pass worms, the Chippewa used the bark for lung problems. The Iroquois used the bark for tuberculosis, in abortive mixtures, and in blood cleansing formulas. The leaves were used in poultices for burns and the Potawatomi used the leaves as a poultice for frostbite. The Rappahannock made a wash for poison ivy from the north side of the bark. The Forest Potawatomi relished Beech nuts as a food. They took advantage of the industry of Deer Mice who carefully shelled the nuts and stored them in hollow logs and trees. The Indians were led to these stores by examining the refuse of the mice, scattered on the snow. Beech trees aerate the soil and distribute potash through their leaves. All trees will benefit from having a Beech in the vicinity. Beech leaves make an excellent stuffing for mattresses. Animals who thrive on Beech nuts include deer, thrushes, pigeons, bears, martins, squirrels, partridges and turkeys. Beech magic: find a twig of Beech and carve your wish or dream upon it. Bury it under the full or waxing moon. 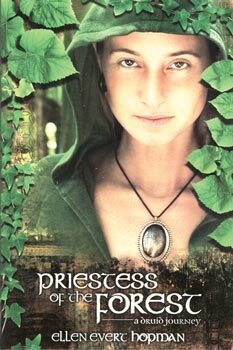 Ellen Evert Hopman is a Druid Priestess, herbalist and author of “Priestess of the Forest: A Druid Journey”, “A Druids Herbal – Of Sacred Tree Medicine”, “Walking the World in Wonder – A Children’s Herbal” and other volumes. Visit her website for more!